Written examination for entry level police officer with the Tiffin Police Department will be administered Saturday November 10, 2018 at 10:00am at NCOESC (928 W. Market St. Suite A, Tiffin, Ohio 44883). Doors will open at 9:00am and NO ONE will be admitted after 9:55AM. A Physical Agility test will be given immediately following the written examination and directions will be given at check in. Applications may be obtained from the Tiffin Police Department or from the Website: www.tiffinohio.gov/forms/ or click here to download the application. Completed applications must be mailed to the Tiffin Police Department at 51 E. Market St., Tiffin, Ohio 44883. Applications must be postmarked on or before November 4, 2018. Applicants claiming veteran’s credit must supply a copy of a military discharge certificate (DD-214) showing honorable discharge. Applicants who have completed the Ohio Peace Officer’s Training Course must supply a copy of their certificate. Upon receiving a passing score on the written examination, applicants will receive additional credit for military service. There is a $25.00 cash fee for the administration of the test, payable at the time of the testing. No checks or credit cards accepted. 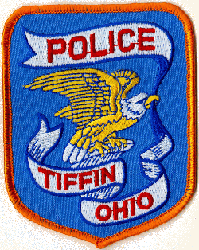 Persons who have previously applied to the Tiffin Police Department must reapply. Starting salary for entry level police officer in 2019 is $21.82 per hour. Within 60 days of appointment, the appointee must become and remain an actual resident of Seneca County, or a county immediately adjoining Seneca County.